Margeaux Walter has a thorough resume that includes a number of solo and group shows, honors, awards and artist residencies. She is currently an MFA student at Hunter College in New York City. Tonight at Dawn: In the “False Awakening” series, your characters appear in a familiar scene akin to the kind in your other projects; parks, dinners, etc. In the next lenticular “frame,” the characters literally appear to be consumed by what they are consuming such as in “High Fructose” and “Sweet Dreams”. Can you explain your intentions in this project? Margeaux Walter: The idea for this series was less literal than some of my earlier work. The first image represents an event happening in reality based on a stereotypical rendering of that event. Then the second image can be read as one that is happening in the mind of these characters, so the lenticular flips between the real and the psychological. The consumption of the characters is one that I see as emotional, but has reference to consumerism, advertising, and some of the overwhelming consequences of modern technology. Tonight at Dawn: The logistics of creating one scene with lighting, props, location, costume changes appear intense to me. How long might one shoot take? Do you often have help? Margeaux Walter: The prep time from conception to the actual photo shoot takes the longest, usually weeks to months. I try to prepare everything so that the shoot itself only takes a few days. I prefer to work alone, but recently in some of the more complicated pieces I have had some help. Tonight at Dawn: Name a song/musician, meal, etc. that you feel would be the audio, gastronomical, etc. reflection of your work. Why? Margeaux Walter: This is a tough one. My first thought was a bento box. It is recognizable, has a strong graphic composition, and yet brings many different elements together, some of which are very unexpected. 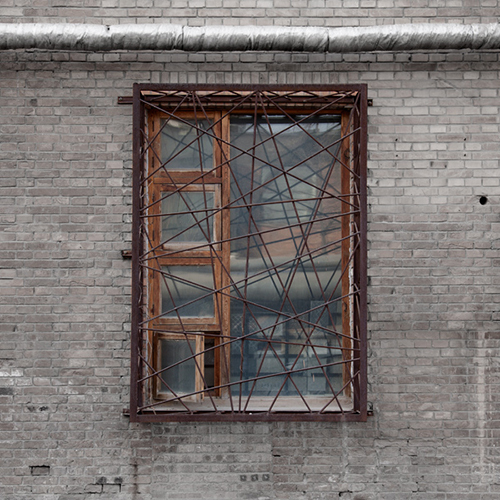 Tonight at Dawn: 今 Jīn, the series that you created during your residency in Beijing that features uninviting windows, looks like a departure from your usual work. How did your experience in Beijing impact your artistic vision? Margeaux Walter: My residency in Beijing was only a month, and I didn’t go there with any agenda or idea. I spent the first week or two on my bike exploring the city. What I began to notice from these bike rides was how fast the city was changing under a strong pressure to modernize / westernize. Buildings would be demolished within days, and be replaced with sterile brick structures. People for the most part do not own their property, as the government can demolish it at will, and so the idea of home and ownership is very different. I became interested in how this phenomenon was affecting daily life and began photographing these new constructions. In some photographs I created a scene happening within the space based on my imagination, and other photographs I left unaltered. Each window reveals tidbits of humanity like grass sprouting in the cracks of a paved parking lot. There is a sharp contrast between the organic and inorganic, which is both exposed and masked by rapid modernization. These images to me represented the face of progress there. Tonight at Dawn: Please tell us about your current group exhibition in Philadelphia; where it is and which projects are on display? Margeaux Walter: I am showing three new lenticulars from my series False Awakening at Pentimenti Gallery in Philadelphia. There are five artists in the exhibit and the concept is about different ways that artists are manipulating paper as a material. The show opens Friday April 4th, and is up until May 24th. Tonight at Dawn: Please share one thing about you that may be quirky or interesting. Margeaux Walter: I own 83 wigs. Tonight at Dawn: If you cannot make it to the current exhibit in Philadelphia, I know there will be many more opportunities to see Margeaux’s work well into the future. Her creativity and vision make it very probable that she and her art will be an ever evolving and steadfast part of our visual culture. Margeaux Walter, “General Admission”, Photographic Lenticular, 40 x 40 inches from the “Crowded Series”. Tonight at Dawn. It may not make sense at first glance, or even, perhaps at second glance and yet it perfectly illuminates this blog for yours truly. Naming a blog is a more daunting task than you might expect. In fact, it is the stumbling block to initiating one because when you establish a Word Press account, it immediately demands that you brand it. It is particularly difficult to choose a fitting name when your blog is more of a variety magazine than one that is devoted to a single subject such as yoga, teaching or model trains. This blog will be one part a journalistic portfolio, one part artistic outlet and one part reflection. Alas, I found my muse sitting on my bookshelf; the Charles Mingus biography whose namesake was his 1961 album, Tonight at Noon. The title track is a tightly woven Mingus tapestry; it slowly builds up anticipation from a darker space and richly layers upon itself with harmoniously contrasting sounds. It is the orchestration I hope to create here through visuals and texts. This blog will be the interplay of light and dark as Tonight at Noon suggests in both title and sound. Shadow and light are the obvious basis of photography, but the twist of “Noon” to “Dawn” is meant to suggest something beyond the lens. Journalism and art are both about shining a new light on the human experience to provoke conversations, change and new beginnings. It is Tonight at Dawn. Welcome.